Cook pasta according to package directions. In a medium saucepan over medium heat, melt butter and add garlic. Cook until fragrant, about 30 seconds. Add the cream cheese and stir until melted. Slowly stir in milk, then add lemon juice, salt and red pepper flakes. 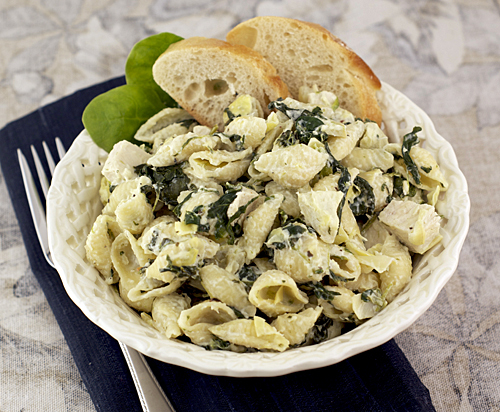 Stir in artichoke hearts, spinach, Parmesan cheese and chicken (if using). Drain pasta and add to artichoke mix. Toss and season to taste with salt and additional lemon juice as needed. Serve with additional shredded Parmesan. SO GOOD! Husband couldn't stop complimenting how good this recipe is. If you like spinach artichoke dip, then you'll love this recipe because it's basically that over pasta. Who knew vegetarian dishes could taste this good. And a side note: Visit this website to find out what Meatless Monday is and why it's so important.